I looked everywhere for an orchid cloth. I did have have one, but knew that the urauchi step would not work due to this cloth being a synthetic. So I turned to my reliable rose. This is actually a leftover piece from a previous scroll done for a dojo up in Washington. And although the pattern on the kireji is not an orchid, this cloth still evokes the same visual and olfactory stimulation from the meaning of the poem. This was a writing done by Yoshimi a couple of years ago. She was advanced in rank due to this submitted writing. It is done in the sousho style. This display could be used for a springtime or early summer themed display when the orchids are in bloom. The shoku for the tree is too small, but it is the only one that I own. 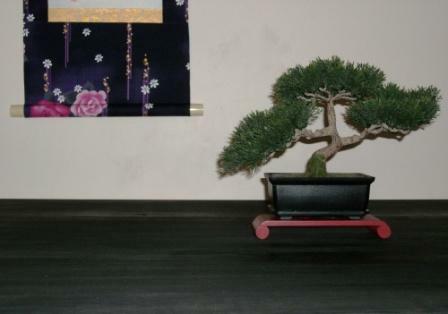 Also, the bonsai is not real. I have a black thumb and kill every living bonsai…so I just have to go with what works for me. This scroll’s painting was done by Ren Adams in Albuquerque, New Mexico. She helped me man my booth at a Karate tournament in Albuquerque New Mexico. This scroll is for sale. The first thing that came to my mind in developing the scroll was the solitary setting in nature. The common items of the 山侍Yama Samurai (Mountain Samurai) are very apparent in the picture, including the 着物 kimono (robe)、蓑 mino (straw hat)、刀 katana (sword). This scroll took an extraordinarily long time to make, because I had a hard time envisioning what I wanted to show in the scroll. I finally decided that this would look best in a Nidan Hyougu style (2 Step Scroll) without the Ichimonji (brocade). Originally I had attached a khaki for the Ten and the Chi, but due to problems with the cloth I had to change it to the Navy cloth. It still had some problems, with a little Uki, which made me very disappointed. I do love how the red karakusa makes the scroll pop but to me does not detract from the artwork on the Honshi. In designing the display, I wanted to contrast two different ways of life. There is the recluse living within nature, and the court maid experiencing the opulent court life. Both must find joy in their respective difficulties. The mountain hermit suffers from exposure to harsh elements, and scarcity of food. However, being away from the distractions of society he is able to attain enlightenment and search his inner soul deeply. Does not this bring joy to the individual? The court maid on the other hand suffers from the political intrigue, hard work and shifting alliances within court politics. She has the benefits of having bounteous food, drink and apparel and is protected from outside danger and elements. Does not this also bring joy to the individual? In all castes and socialities of human kind, no one will have identical experiences. It is every individual’s responsibility to seek and learn to attain joy in whatever state that fate has been set upon us. We do not know, nor can we control our destiny, but we do have the ability to find joy in whatever state of life we may find ourselves. In the decision to choose virtue, righteousness and joy no matter one’s circumstances, we human beings are all equal. 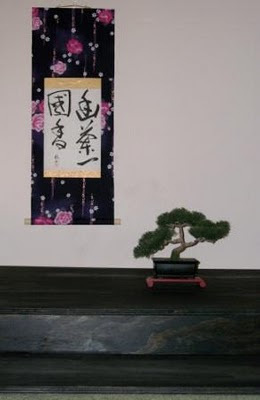 Some are already aware, but I have my first Kakejiku making class scheduled at Bonsai in the Bluegrass. It will be an all day class in Louisville Kentucky. Many bonsai artists know several points about the art of display. Here one can learn the technical side of scroll design and seeing the scroll from a different perspective. The class is limited to 10 students and everyone will learn how to make their own scroll.